Happy early birthday to arisbe, time_shark, and alitalf. May each of you enjoy many joyous returns of the day! 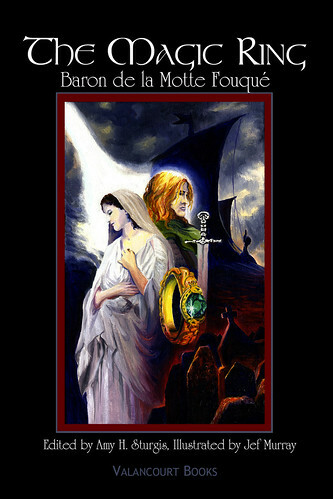 In 2006, I had the pleasure and privilege of editing the first English scholarly edition - and the first English edition of any kind in well over a century - of Baron de la Motte Fouqué's masterpiece, The Magic Ring. Now it is my great pleasure to announce that I've been working for the past several months with the wonderful artist Jef Murray (who most recently illustrated 2009's Black and White Ogre Country: The Lost Tales of Hilary Tolkien) and Valancourt Books to present a hardback edition of the classic epic fantasy, complete with over forty new illustrations. The estimated publication date is March 2010; I will post more when the book is available. Jef Murray has created a Facebook page for the book here. It is the twelfth century, the era of Richard the Lion-heart and the Third Crusade. Along the Danube, the tranquil world shared by the young squire Otto and his cousin Bertha is changed forever when they witness a knightly contest for possession of a magic ring. Soon both are drawn into a quest that transforms them and endangers all they love. The resulting adventures lead each to different paths of enchantment and peril, from the mysteries of Moorish Spain to the birthplace of Norse mythology. While navigating an ever-changing sea of allies and foes, both natural and magical, the two seek love, honor, survival, and a ring that possesses more power than either can possibly understand. A seamless blend of medieval quest, epic fantasy, and Gothic nightmare, The Magic Ring draws on an impressive host of inspirations, such as Germanic folk tales and Icelandic sagas, Arthurian romance and Gothic horror. This novel has earned its place as a text of considerable historical significance, and yet it continues to offer an exhilarating reading experience for the modern audience. Oh my gosh, that is so cool! I can't wait to see an illustrated copy! Yay! Thank you so much! I can't wait for you to, either - Jef's illustrations are absolutely gorgeous. Thanks so much! We're very excited. The new illustrations are amazing! Thank you so much! I'm just thrilled with Jef's illustrations. They are gorgeous. Very, very cool! This is one I've been meaning to read for ages and this seems to be the edition. The only Valancourt I have is their edition of The Necromancer, which is pretty goddamn handsome--and I'm pleased to see they've got Reynolds' Mysteries of London on the horizon. Especially glad you pointed this out as I've never checked out their site before; what a cool company! Bookmarked. Fantastic! Thanks so much for your interest. I really like Valancourt Books. I also edited another book for them - a novel I love and now teach - called The Magic Goblet, and I have quite a few of their other publications, too. Major congrats, cong-mice, & cong-rodents-of-choice. This is a most elegant project! Thank you! I'm so pleased - Jef's new illustrations are remarkable.